8:30 am: Pick up at your hotel and go to visit the Ho Chi Minh Complex where we can see Ho Chi Minh’s Mausoleum, President Palace and Ho Chi Minh’s house on stilts. Lying to one side of the Mausoleum is One Pillar pagoda founded by King Ly Thai To in 1049 .The structure has become an important symbol for Hanoian. Continuing to visit Tran Quoc Pagoda - One of the oldest pagodas in Hanoi and the Temple of Literature and Quoc Tu Giam – the first National University in Vietnam, where you will be introduced its history since 11th century. Its gardens and well - preserved architectures offer a relaxing glimpse into Vietnam’s past. 12:30 am: Have lunch with Vietnamese food. 13:30 pm: Visit the interesting Ethnology Museum. Located west of the city centre, this museum offer informative and well-documented display on the country’s 54 ethnic groups, include elaborate and colorful hill-tribe costumes, weaving designs, musical instruments, fishing implements, work tools and other functional objects. The display continues on to the garden outside with fascinating examples of minority housing from the King’s to the ones of the ethnic groups in Central Highlands. 3:30pm visit Hoan Kiem Lake (Restored Sword lake) and Ngoc Son temple. AM: Pick you up at your hotel at 8.30. Transfer to visit Bat Trang pottery village. On the way to Bat Trang village, you have a chance to see the property of the villages located along the two banks of the Red River Dykes and the lifestyles of dwellers. 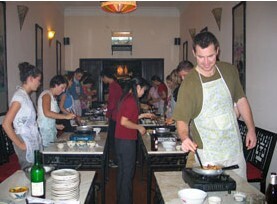 Two hours visiting Bat Trang village, then have lunch at a Vietnamese traditional restaurant. Note: Joining group tour is not available. - All entrance, permission and visiting fees. Locating in Ninh Binh Province, Hoa Lu used to be capital city during Dinh Dynasty during AD 968 and AD 980. Coming to this former citadel, besides historical sites, astounding natural beauties of limestone and mountains would dazzle all the guests. Many passengers would have the feeling of explore Ha Long Bay on land. Departing from the hotel at 08:00 AM, passing 130 kilometers drive we would arrive at Hoa Lu, Ninh Binh Province. The first stopover is temples of Kinh Dinh and Kinh Le who devoted their lives to against Chinese evaders in the past. 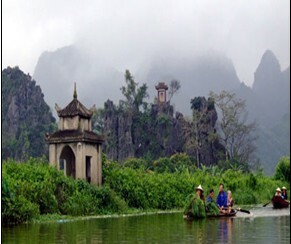 After that we would pass through green mountains and paddy field to reach Tam Coc then stopping for lunch break. 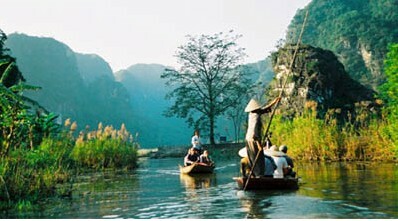 After that we would take the bamboo boats to discover natural beauties blended with green field and mountain ranges. For three hours of rowing, we leave boat to drive to Bich Dong pagodas for stunning complex of pagoda built on the cliffs. Keep trekking to the top of pagoda then moving down to the waiting car. 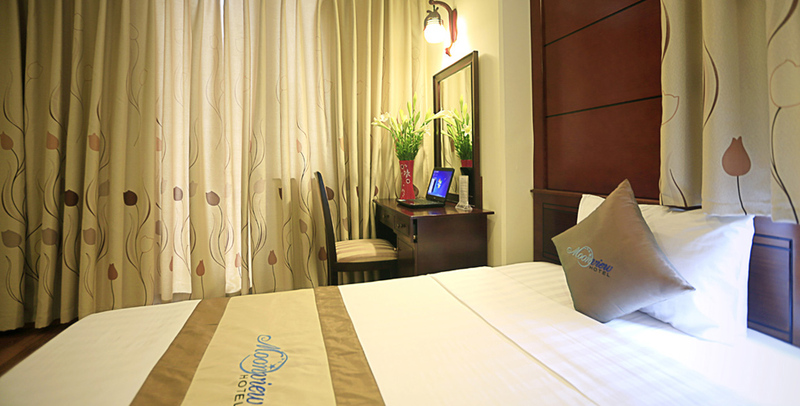 Return to Ha Noi Capital and finishing the tour when dropping you off at the lobby of hotel. The end of the tour ! Note:- Trips can be tailor made on your request.- Please contact us via email, telephone or fax at the contact details section..
At 8:00 am: Guide and car will take you to Ba Vi National Park, 48 kms west of Hanoi, covers an area of 7, 377 ha on a range of high mountains. 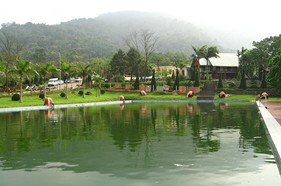 The park is famous for its rich and diverse flora and fauna comprising tropical and subtropical species. Wandering about the forest, you seem to live in a fairyland surrounded by cloud-capped mountains and roaring waterfalls. Climbing up to the top of the mountains, you will find a temple dedicated to the Tan Vien God and can take an enthralling bird’s-eye view of the surroundings. 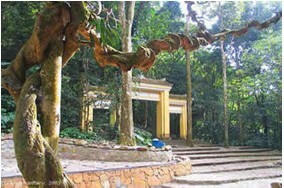 The primeval rain forest of Ba Vi National Park boasts a wide range of flora and fauna. This is the perfect getaway from the hustle and bustle of Hanoi and is easily accessible. We depart Hanoi for the one and a half-hour drive to Ba Vi. Lunch at Local restaurant. After lunch we visit a Temple dedicated to the God of the Jungle. There will be time to relax in these tranquil surroundings before starting our journey back to Hanoi about 5pm. A journey to Duong Lam village is a trip to trace back the origin of Vietnam's culture and Vietnam's traditions. This is also the great chance explore architecture of ancient houses while wander along its narrow alleyways, visit temples dedicated to the two kings born there, and most interesting of all, chat with locals living in the ancient houses. Leave your hotel in Hanoi about at 08:00 am and travel to west of Hanoi to Duong Lam village, a purely agricultural village of the Northern Red River delta where still preserve many hundred-year-old houses. 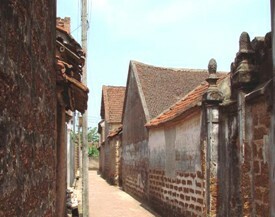 Upon arrival, walk along tiny ancient alleys to visit Mong Phu temple in Mong Phu hamlet - the only hamlet whose original village entrance gate remains intact, dedicated to national heroes. Continue walking around the village to discover the daily life and farming working of Vietnamese peasants along the terrace with a stop in two ancient houses: the biggest ancient house was build 200 years ago and the most ancient house back to 400 years ago. Have a lunch. After lunch and resting, visit Ngo Quyen temple and Phung Hung temple, places dedicated to two national heroes Ngo Quyen and Phung Hung. Again biking to visit Mia Pagoda (other hamlet in Duong Lam village), is built in 15 th century and admire 287 statues of all sizes, among with are famous sculpture such as the statue of Buddha in the Himalayas and the statues of the Eight Vajra Deities. Drive back to Hanoi. Tour finishes about 5:00 pm. Hanoi, the capital of Viet Nam since the 11th century dazzles visitors with its unique blend of oriental lifestyle, French colonial architecture, tree - lined boulevards and peaceful lakes. Still retaining a charming air from its colonial days, visitors are often impressed with the quietness and subtle beauty of Hanoi. 8h00: Pick up at your hotel and go to visit the Ho Chi Minh Complex where we can see Ho Chi Minh’s Mausoleum, President Palace and Ho Chi Minh’s house on stilts. Lying to one side of the Mausoleum is One Pillar pagoda founded by King Ly Thai To in 1049 .The structure has become an important symbol for Hanoian. 10h00: Visit Tran Quoc Pagoda - One of the oldest pagodas in Hanoi. 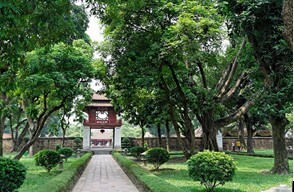 11h00: Visit The Temple of Literature and Quoc Tu Giam – the first National University in Vietnam, which was built in 11th century. Its gardens and well - preserved architectures offer a relaxing glimpse into Vietnam’s past. 12h00: Have lunch with Vietnamese food. 13h30: Walking in the old quarter (36 ancient streets) and visit the traditional house of Vietnamese people dated back 1890s. Then visit Dong Xuan Market – one of the biggest wholesale markets in the North of Vietnam for shopping and have great bargain. 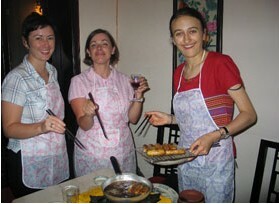 At 8:00am: The guide and car pick you at the hotel and depart for Perfume Pagoda- The Buddhism holyland. 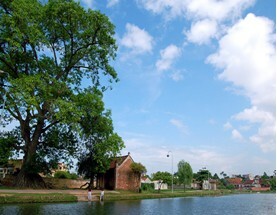 On arrival, take rowing boat along Yen Stream, stop over at Trinh temple. From the landing, you can choose either by using cable car or walking on foot to the main Pagoda which is located inside Huong Tich grotto. Have lunch. Afternoon: Visiting Thien Tru Pagoda before boating back to the whalf. Return to Hanoi. Arrive Hanoi at 18:30pm. Note: Normal dress is politely requested. Orderly baggage.